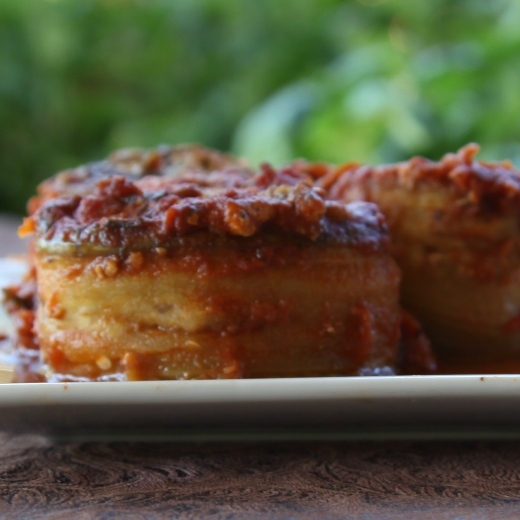 Eggplant is used in place of noodles in the vegetable and ricotta cheese filled rollatini or make it vegan with tofu. Jazz up your jarred spaghetti sauce! Heat sauce in small saucepan over the stove and add 1t fennel seeds, 1/4C dry red wine, 1-2 cloves fresh pressed garlic, 1T extra virgin olive oil, and a bay leaf. You can also add 1T each of fresh minced herbs like rosemary, basil, and oregano to the sauce before heating it. Bring to a boil, then simmer until ready to use. Use 2 jars of sauce, so you have extra leftover to serve on the side with the rollatini for those that like to add extra sauce to each serving of cooked rollatini. Wash eggplant and lengthwise, with a very sharp knife cut as many thin slices as you can. These are your eggplant "noodles". Salt the slices on both sides and lay in a glass dish or on paper towels. This removes extra bitterness and makes the eggplant "noodles" easier to roll up. If you are going to jazz up your jar of spaghetti sauce then start it now and let it simmer - see note. Wash all the other vegetables. Add mushrooms, onion, garlic, zucchini, bell pepper to a food processor and chop or mince finely by hand and add to large bowl. In a small bowl, mix ricotta cheese and egg, if using and blend well then mix into the chopped vegetables,add salt and pepper and mix well. If choosing the vegan or plant-based option, crumble up the tofu, and add to the chopped vegetables, add salt and pepper and mix well. Put a little of the sauce in the bottom on an 8" x 8" or a 9" x 9" glass baking dish. Pat one of the eggplant "noodles" dry. Lay one flat and add some of the vegetable/cheese or vegetable/tofu mixture down the middle of it stopping about 1 to 2 inches away from the end of the eggplant "noodle". Roll up the eggplant "noodle" as tight as you can but loosely enough to keep filling inside of the eggplant strip as you roll it up and secure with a toothpick. 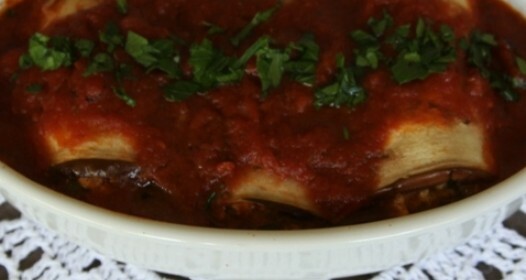 Place the eggplant rollatini in the baking dish. You can set the rolls upright or you can put the rolls on their sides with the overlapped end down, depending on the look you want. Repeat until all the eggplant "noodles" are used up or the filling is gone or the pan is full. Insert in oven and bake 20-30 minutes or until rollatini is heated through. Sauce will begin to bubble around the edges of pan. TO SAVE TIME: layer the eggplant like lasagna noodles across the pan, add a little sauce then a little topping to each eggplant "noodle" then top with another layer of eggplant noodles, and repeat until the pan is full one to two inches below the rim. Top the cooked eggplant rollatini with fresh grated parmesan Reggiano (cheese option) or nutritional yeast (vegan option) and/or some fresh, chopped Italian parsley. You can use an extra jar of sauce if you want to add more sauce to each individual serving. Pair with a huge green salad and enjoy!